I just finished my stay at the luxurious Pointe Hilton Tapatio Cliffs Resort and I am super sad to leave. Why do vacations end in a blink of an eye? Well even though the time flew by, my stay was nothing sort of fabulous and The Pointe Hilton Tapatio Cliffs Resort is a spot you need add to your vacation list! 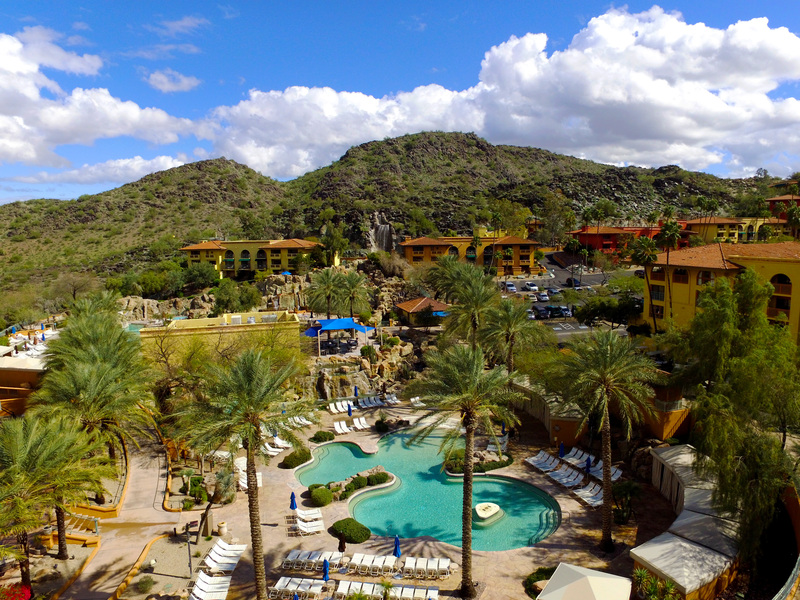 The Pointe Hilton Tapatio Cliffs Resort is located in the North Mountains nestled cliff side in Phoenix, Arizona. No matter which building you stay, or which area you are exploring on the property, you are guaranteed to soak in impactable views. Not only are the views wonderful but the resort has numerous amenities available during your stay from full-service spa, awarding-winning golf, eight fabulous pools, Starbucks coffee shop, fitness center, three restaurants conveniently on-site that also offer in-room dining, a boutique gift shop with a variety of souvenirs, seasonal activities and more. As I arrived, I was greeted by everyone in the lobby. I felt so welcomed. I was provided with water, as you must stay hydrated during these fantastic hot temperatures – 111 degrees to be exact. I was fully briefed on all the amenities the property had to offer as well as off property activities. A map was provided highlighting the areas I wanted to explore as well as the location of my room. I was shuttled to my room and was ready to take on the festivities. Their room suites (all 584 of them) are very spacious and also have separate living areas. There is a balcony located off the bedroom to take in their breathtaking views. They have incredibly comfortable bedding where you can also utilize the blackout blinds for an even more tranquil sleep. There is a mini-refrigerator fully stocked and or large enough for you to bring in your own treats. And a separate bathroom area that made it easy for people to shower and get ready in different areas. With the rooms being so spacious, it is perfect for families to share and still feel as if they are in their own room. My husband and I had plentily of room for the two of us and used the living room area as the hangout room for other family members. Since I was born in Arizona, nothing makes me happier than lounging poolside getting kissed by the sun. I love having a healthy bronzed skin! The resort has eight pools scattered throughout the property. I spent 95% of my time at The Falls Water Village location because it had everything I needed: lounge chairs, private cabanas, spaciously large pool, full-service bar and café, hot tub, volleyball, enclosed waterslide (not really my thing but I gave it a go), tranquil cascading waterfalls and 100% relaxation! The only minor downfall was the temperature of the pool was pretty chilly. It wasn’t your normal refreshing cold that when you’ve been sunbathing and needing to cool off. But again, didn’t keep me away and it’s not the end of the world. The restaurant in the pool area is Cascades Café and I had wonderful service every day I was there. The cocktails are FABULOUS! They are super refreshing and kept me hydrated and cool while sunbathing. Food was great for sharing and pretty delicious. Even though the other pools on site were nice, this one by far was my favorite. It has something for everyone in your party. Not only do they have the Cascades Café restaurant, the resort also has two other fine dining restaurants onsite: Different Pointe of View and Pointe In Tyme. Different Pointe of View is by far their most popular. It is located mountaintop within the resort property (be sure to jump on the shuttle as it is a hike). Breathtaking, panoramic views that will stay in your memory forever. Absolutely stunning and a perfect place for photos. I loved the ambiance and the menu is very sophisticated. Pointe In Tyme is located near the Pro Shop not too far from the lobby. I dined there a few times for breakfast and enjoyed the cuisine. If you don’t want to leave the resort, this restaurant is perfect for breakfast and lunch. The pricing was a little high for breakfast but everything on the menu looked very appetizing. As many of you know, I live in Philadelphia and I am always up before sunrise, which was ideal for me to walk the entire property and take in the panoramic views of downtown Phoenix, the beautiful desert valley landscape along with the views of the resort. And let’s not take hike lightly. With this beautiful resort being cliff side of the North Mountains, there are hills, many of them and they are steep. Yes, the property does offer round the clock shuttle service (which is amazing) but I recommend walking the property at least twice during your stay (morning and night). I really enjoyed the peacefulness during my hike. I was in awe of the views and I promise you, the pictures do not give it justice. As a reminder, be sure to bring a good pair of walking shoes. You will be glad you did. I give this property major kudos around their creative for activities. There are so many activities available during your stay and you can find the listing here. One that I experienced was the Saturday Wildlife World Zoo Visit. Every Saturday at 11:00 a.m. they bring in a couple of wildlife animals from the Zoo to show their guests the variety of animals that come to visit. This is a great activity for families and the best part is that it takes place at The Falls Water Village. You can still enjoy adult time by the pool while your kiddos sit nearby learning. The resort was perfect for my cousin’s wedding. Not only did I get some much-needed R&R but with me being in the events industry, it was great to experience the full experience of what this resort can offer with their meeting and event space. All of their event space is very sophisticated and perfect for all types of meetings and events. They have over 65,000 square feet and 36 meetings rooms that can accommodate events from 50, to 1,500 participants. If you are looking for a new location to wow your participants, you must check them out! They have 584 all-suite accommodations with fabulous amenities. They are only 12 miles (roughly 20 minutes) from Phoenix Sky Harbor International Airport. Find out more details here. To say my stay was unforgettable is an understatement. Not only did I love many things about the resort but hanging out with my family made it even more amazing. There was something for everyone and it was great to have everything we need onsite (there is a Safeway grocery store nearby to stock up on any of your favorites during your stay). Their staff is exceptional, and they truly made sure my stay was everything and more of what I excepted. Everyone was friendly and very attentive. I loved my experience and happy my cousin chose this location for her beautiful wedding. Thank you again The Pointe Hilton Tapatio Cliffs Resort for a fabulous time! Want to experience The Pointe Hilton Tapatio Cliffs Resort, click here. If you are looking for a delicious restaurant off property, be sure to check out one of my favorites Mora Italian by chef Scott Conant.